On a list of fun tasks, non-automated fastener selection and assembly would rank just above cutting a lawn with scissors on a hot day. Tedium, wasted time – Creo Parametric lets you sidestep all that. Creo Intelligent Fastener Extension (IFX) an extension to Creo Parametric builds on these capabilities with a fully customizable library. You have your own part libraries, ones critical to your product. With Creo IFX, you can migrate your legacy fasteners easily into the existing library to create your own customized library. Now you can use the fasteners you’ve always used and let Creo IFX go to work. 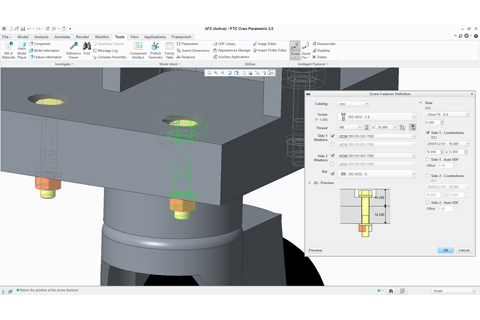 Creo IFX will automatically define clearance holes in the required parts and assemble your fasteners on all instances. You’ll save design time, reduce, product development costs, eliminate errors and get to market more quickly.